Aside from using black and white, you can do a lot in your man cave. Let this condo home in Makati inspire you. Despite intending to rent out this unit from the time it was purchased, homeowner Trixie decided to go all out in designing it. She made the wise decision of tapping a professional to work on it, rather than spending most of her weekends shopping for furnishings herself. Trixie learned of design consultant Grace Moslares of Magara Designs through a common friend. One of the first things Grace and Trixie discussed was the budget. At first, Grace thought it wouldn’t be enough, but after finding out that Trixie had already bought most of the furniture, Grace went to work immediately. “All we needed was to set up [the furniture] properly. Pero bare pa rin siya, [so we added accessories]. I had a nice feeling na kaya naman,” Grace relates. 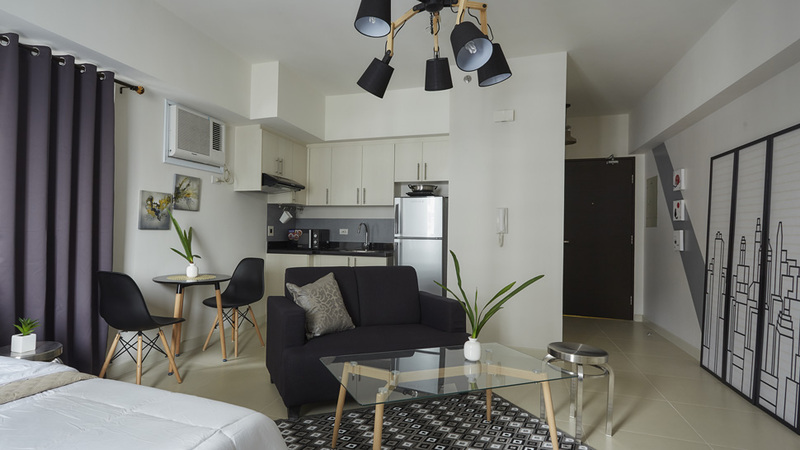 The 30sqm unit is one of several units that Trixie purchased as investment, each with a different theme. This studio unit takes on a modern, contemporary look—most ideal as a bachelor’s pad. According to Grace, it is a “safe” theme, which makes use of the color tones of the existing pieces.